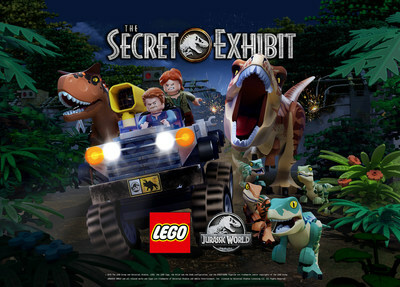 UNIVERSAL CITY, Calif., Nov. 30, 2018 — (PRNewswire) — On December 1st, fans can enjoy re-watching the fun-filled adventures of "LEGO® Jurassic World: The Secret Exhibit" – plus two minutes of bonus content – exclusively on the SYFY Network (check your local cable provider for air times). The bonus content includes never-before-seen bloopers from the animated special inspired by the blockbuster Jurassic World franchise. View a new teaser clip here. The story takes place before the adventures of Jurassic World in 2015. In the special, Simon Masrani has an idea for a new attraction that is guaranteed to keep Jurassic World at the forefront of theme park entertainment. It's the greatest thing since the discovery of dinosaurs, but in order for it to succeed, he needs his right-hand can-do problem solver, Claire Dearing, to get a trio of dinosaurs across the park to the new, super-secret exhibit. Reluctantly teaming up with newcomer Owen Grady, the animal behaviorist she hired sight unseen to deliver the dinosaurs, the duo set out on a fun-filled adventure across the island. Unfortunately, delivering the dinosaurs to the new attraction is not as easy as they thought. The two-part special is now also available to stream across multiple platforms, including the NBC app and NBC.com, where it can be viewed without a login, as well as on Hulu and On Demand. Additionally, it is now available for download from major digital retailers. The DVD, with four minutes of bonus content, drops Jan. 15, 2019. For more information, visit www.jurassicworld.com. With the grand opening of Jurassic World's new super-secret dinosaur exhibit just days away, only one thing is missing - the dinosaurs! In order to get the job done, Simon Masrani enlists his newly-hired assistant, Claire Dearing, to ensure the new attraction opens on time...or else. Unfortunately, Owen Grady, the animal behaviorist Claire hired to deliver the dinosaurs, is late. Things aren't looking too good for Claire...or for Owen, who just wants to deliver the dinosaurs, collect his paycheck and get off the island. Universal Brand Development globally drives expansion of the company's intellectual properties, franchises, characters and stories through innovative physical and digital products, content, and consumer experiences. Along with franchise brand management, Universal Brand Development's core businesses include Consumer Products, Games and Digital Platforms, and Live Entertainment based on the company's extensive portfolio of intellectual properties created by Universal Pictures, Illumination Entertainment, DreamWorks Animation, and NBCUniversal cable and television. Universal Brand Development is a business segment of Universal Filmed Entertainment Group, and part of NBCUniversal, a subsidiary of Comcast Corporation. www.universalbranddevelopment.com. LEGO, the LEGO logo, the Minifigure and the brick & knob configuration are trademarks and/or copyrights of the LEGO Group. ©2018 the LEGO Group.